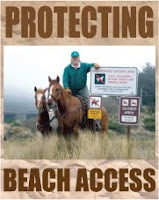 Regarding Uri Driscoll's recent column on equestrian restrictions, I support the notion that horses belong on local trails and in nature (where vehicles don't). 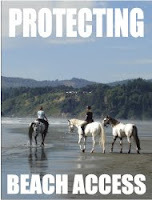 I frequently walk on Little River State Beach and love seeing the horses and riders there. I celebrate the restrictions on vehicle use in that area over the past year or so. After witnessing crazed drivers doing donuts and whizzing past at breakneck speeds too close for comfort while sullying up the seabreeze with fumes, I'm relieved not just for myself, other hikers, dogs, horses (even the occasional cat on a leash! ), but also for the much more vulnerable wildlife eking out a living in that coastal zone. One of the more touching sights I've ever seen on the beach happened just last weekend and recalled Driscoll's anecdote. You may have noticed how far the tide's been out lately. It makes for a large space for human and hoof prints to remain in the wet sand. At the waveslope near the parking entrance, I saw a string of, oh, maybe a dozen perfectly round prints in which about that many plovers were resting. A few were playing musical chairs with the last two remaining prints, sparring to claim the sheltered spot. The rest seemed to be, one plover to a hoofprint, greatly enjoying the shelter and view of the waves. Seems to me the plovers (not to mention this human witness) much more benefited than suffered by the presence of horses on the beach!